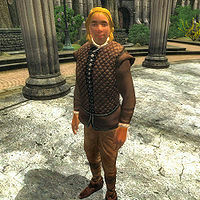 Salomon Geonette is a Breton commoner and musician living in the Imperial City's Temple District. He is married to Renee Geonette, and he owns a dog named Charlotte. Talk to Salomon, and he'll tell you he was commissioned by the Emperor to compose a symphony. Salomon spends most of his time at home. He wakes up every morning at 6am, and eats breakfast in his house's main floor for two hours. On Tirdas and Turdas, he then goes to the Market District to wander around for four hours until noon. He then heads home for the rest of the day. On Morndas, Middas and Fredas he stays home until noon, when he heads to the Arboretum to relax for six hours, before heading back home at 6pm. On Sundas, he spends his morning worshipping at the Temple of the One from 8am to midday. At all other times, he wanders around his house until his bedtime at 11pm, including all day on Loredas. Salomon takes a trip to Bruma on the 8th of every month at midnight, staying until midnight on the 10th. While there he stays at Olav's Tap and Tack, wandering around the main floor. He also goes to the Black Horse Courier every month on the 27th and will hang around for a brief amount of time before resuming his normal schedule. He was supposed to send Olav a letter as part of the unfinished quest to do with couriers. There are only two exceptions to this schedule. During the Light the Dragonfires quest when the Imperial City is under martial law and Salomon is confined to his house. Also, if Salomon is in Bruma during the Bruma curfew, he will leave and return to his house. Salomon wears a pair of tan linens, doeskin shoes and a quilted doublet. He always carries his house key around with him, as well as a small amount of gold. Salomon has two unique pieces of dialogue. The first time you meet him, and 20% of the time thereafter, he will say, "Salomon Geonette. I'm a musician. I had a commission from the Emperor to compose a symphony... But now, with the emperor dead, everything is at sixes and sevens." When asked about the Imperial City, he will tell you, "Soon, the Elder Council must choose a new emperor, and then I suppose they'll sort out my commission. Until then, I just have to keep on working." His wife, Renee is proud of his work and will tell you that "Renee Geonette. My husband, Salomon, has a court commission to compose a symphony. ", as well as "It's so sad. Salomon was to compose a symphony for Uriel Septim, to be performed for the whole city in the Arena." Esta página foi modificada pela última vez à(s) 05h46min de 20 de outubro de 2015.